Description of "25 Lessons From Uncommon Thoughts"
This book is based on the author’s childhood observations, his work life experiences and his insights as a self employed and independent working professional. The story telling method profusely laced with wit and quotes has been used to convey lessons from uncommon thoughts. For example, the author talks about focusing on strengths while conventionally we spot weaknesses and put lot of efforts on correcting it. In trying to do what others are doing we miss out on our passion. At the end of our school and college years, we have lost our strengths because we had no time to cultivate them, and our weaknesses remained as before because we had no passion for those subjects. The message to youngsters from all streams of life is that they must develop core skills of learning, thinking, striving, relating and listening. We need to challenge the assumptions and change ourselves, for if we go on doing things as before, we will remain where we were. The author realises from his life experiences that we are wrong in most of our preconceived thoughts and feelings judging people by their name, dress, appearance, and so forth. Failing is inherent when you work and experiment, and sometimes may get conned, or lose in the stock market, but every failure has to be seen as a way of learning and moving forward. ‘This too shall pass’ is something we must not forget in both our good and bad times. The author is a big advocate of entrepreneurship and wealth creation sharing examples of entrepreneurial drivers to motivate people more qualified and experienced to take up an entrepreneurial career. The book contains many lessons for all like refiring yourself than considering early retirement, doing things than sermonising, refraining from blaming others, trusting people, replication and growth of business through standardisation, systems and processes, like the success of McDonalds and the Toyotas, and continual learning, for knowledge never goes waste. Jitendra M Pant is a mentor, certified management coach, certified emotional intelligence coach, management consultant, trainer, and visiting professor. His core areas of work are operations excellence; total productivity and quality management- 5S, Kaizen, QC tools, Problem solving, Six sigma; project management; entrepreneurship-business plan and innovation; business strategy for SME units; soft skills; managing career transitions and enhancing employability; people development. He has been very effective in coaching owners of small and medium size organisations and institutions. J M Pant is a mechanical engineer from I.I.T. Delhi with post graduation in production and industrial engineering, also from IIT-D, and management diploma from UBS, Panjab University, and having over four decades of experience in industry and consultancy. His greatest strength is versatility and holistic approach to problem solving. He is a fine blend of technical, commercial and behavioural skills. J.M.Pant has completed international projects in Japan, South Korea, U.K and Kenya, and has widely travelled overseas for learning and development. J.M.Pant has recently authored a book titled 5S:First vital step towards operations excellence (A5 size), which is available online at pothi.com, amazon.in and flipkart.com. 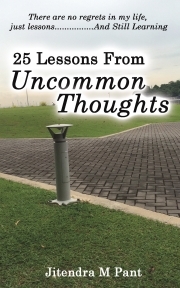 Reviews of "25 Lessons From Uncommon Thoughts"